White Sun Lounger. 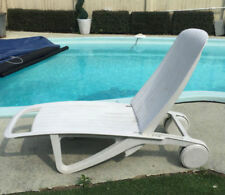 White plastic sun lounger in excellent condition. MULTI POSITION BACK REST. CREAM CUSHION, WITH STORAGE BAGS. 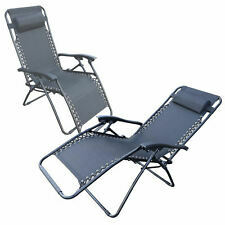 A set of 2 luxury padded sun loungers, they have 3 reclining positions and can lay flat. 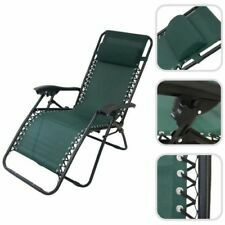 These TOP QUALITY chairs have 20mm of polyester padding so alot more comfortable than normal textiline garden loungers. This is the high quality set of two Textoline Reclining Chair is incredibly comfortable, durable and folds down flat for easy storage. Foldable for easy storage and transportation. Weather proof text line seat, back and pillow. This is a solid wood sun lounger, perfect for the garden when the sun comes out! The wood is weathered but in perfect working condition. It is a sturdy construction, and reclines from different angles to flat. It has wheels to move it around the garden to make the most of the sunshine. The sun lounger pad is included, with ties that attach it to the lounger. Collection only please from SW18. Prefer cash on collection. Feel free to call or text with any questions 07900883770. Thanks Ross. 2 Sun loungers White Resin. Head rest has 4 positions Clean and tidy originally cost about £120 the pair.No longer needed by us as we are downsizing. 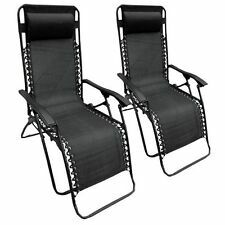 2 x Garden Sun Lounger Reclining Chairs. Condition is Used and padding therefore shows signs of use as do the metal frame chairs but they are still good. Pick up only from Manchester Science park at the following times. Mon 9am - 4pm Thurs 9am - 4pm Fri 9am - 4pm Might be flexible on those times. Please ask. Wooden Garden Sun Lounger X2. Heavy duty and solid Condition is Good. 2 long ones and 1 short one, all in good clean working order, as you can see by photos they are a bit faded. ACACIA HARDWOOD RECLINING SUN LOUNGER. Relax and unwind in your garden, patio or balcony with our elegant and attractive Acacia hardwood Reclining sun-lounger. Made from Acacia FSC hardwood with a teak oil coating that adds an extra layer of protection and provides a beautiful, lustrous finish. It features a high back and headrest cushion to give you added support and comfort while relaxing in the chair. It can be used both indoors and outdoors and has a great looking modern design that will help improve the look of your garden. Set of 2 folding padded green check garden sun lounger recliner chair which is a multi position lafumo style reclining relaxer garden chair with extra comfortable cushion padding. 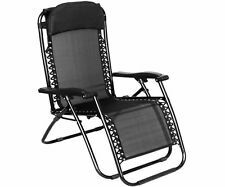 Lightweight relaxer garden chair, ideal for camping or patio use. GARDEN PATIO BEACH FOLDING SUN LOUNGER. 1 x Folding Sun Lounger. The garden is one of the best places to turn for relaxation, and the right selection of garden chairs makes it easier to settle in to relax. Textoline Fabric - Dries quickly and can be wiped clean. Black Reclining Sun Lounger. Quick and simple dispatch. You're always in safe hands. Order Alterations. Width: 66 cm. Beautifully sleek and stylish the fully reclining ‘Vicky’ sun lounger is perfect for the serious sun bather who requires a modern designer look without compromising on comfort. Built to last in lightweight 100% rust resistant aluminium the ‘Vicky’ has 4 adjustable levels allowing you to recline to the most comfortable position depending on whether you are reading, relaxing or chatting. 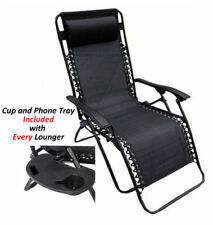 This is the new design and high quality outdoor camping beach folding sun lounger bed garden recliner chair. It features a high back and headrest cushion to give you added support and comfort while relaxing in the chair. The perfect place to relax and sunbathe in your garden. Madison Padded Relaxer. Relax under the sun in your garden on this fabulous padded relaxer. Hardwood sun lounger with wheels for easymanoeuvering around your garden or pool area. The sun lounger has a pull out drinks table and three reclining levels. Hardwood Recliner Sun Lounger. Wooden Sun Lounger with Tray. COLLECTION ONLY CW1 AREA. 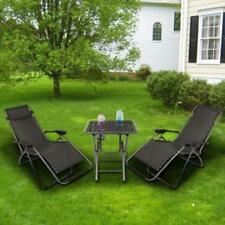 Set of 2 textilene loungers with co-ordinating table. Twin Sun Lounger Set. THIS IS A PAIR OF WEATHER SCREEN SUN LOUNGER COVERS, TO FIT MOST TYPES OF GARDEN SUN LOUNGERS, INCLUDING STRONG EYELETS FOR SECURE FITTING. The open weave elastic lacing of the seat provides perfect hammock like comfort as well as ventilation to keep you cool, and the quality rubber wood arms provide perfect relaxation. Once you have found the perfect position you can lock your chair in place using the twin locks located on each arm and relax. These TOP QUALITY chairs have 20mm of polyester padding so alot more comfortable than normal textiline garden chairs. Textiline is in a patterned tweed colour. Detachable and adjustable head rest. Padded Garden Sun Lounger Relaxer Recliner Chair in Tweed Weatherproof Textoline. Folding recliner garden chair - full length Thick padded removable cushion cover Folds up when not in use Metal frame, plastic arms In great used condition. CASH ON COLLECTION PLEASE COLLECTION ONLY. Can deliver locally (TN24) at nominal cost to cover petrol. Please contact me first though. Safety Notes Do not stand on the lounger or allow children to play on or around the lounger. Material Steel, Powdercoating, PE rattan, Polyester. • Removable cushion. Type Garden Furniture. • Height adjustable back rest.